My latest op-ed, title above, appeared in The Virginian-Pilot last Thursday. 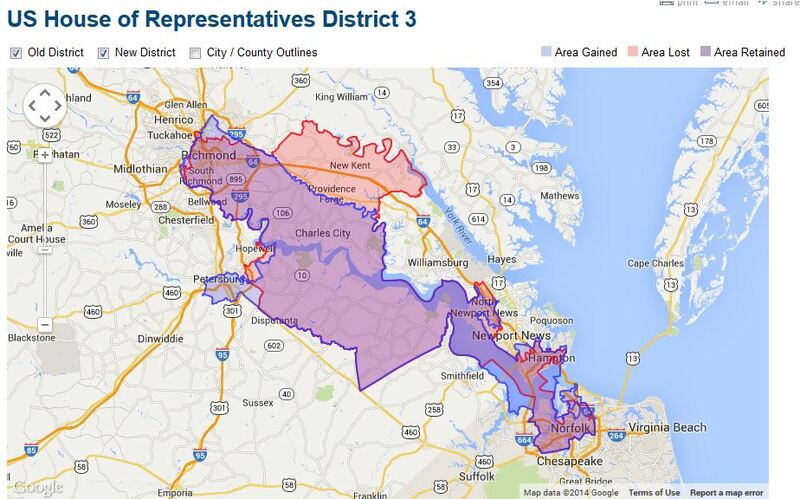 The topic, of course, was the ruling last week (pdf) that Virginia’s 3rd Congressional district has to be redrawn. If the 3rd is redrawn, the surrounding districts have to be redrawn as well. This is a golden opportunity to get redistricting done right – as long as the public puts pressure on the legislators to do so. Honestly, I had completely forgotten about this case, although I had been made aware of it at the time it was filed. That it managed to be heard is one heck of a feat. Kudos to those who kept it alive. Several lumps of coal, though, to the lack of press coverage prior to the decision. One thing that I didn’t mention in my column – ran out of room – is that with the gutting of the Voting Rights Act, Virginia no longer has to apply for preclearance of its boundaries. That’s a good thing and a bad thing. The good is that those in power can’t use retrogression to justify the packing of minority voters into a single district, because no one is looking at the percentages. The bad thing is, well, no one is looking so it’s very possible that things could end up being worse. I’m a little surprised I’ve not heard something from OneVirginia2021 since the decision. Yes, I know they were looking to 2021 but I certainly hope they intend to be involved in the current exercise. After all, the legislature is still in session and could be working on this right now. I hope OneVirginia2021 is gearing up for a push so that this isn’t done like the last one was – in the proverbial smoky back room. It has never made sense to me that legislators get to choose their voters rather than the other way around. Of the 11 congressional districts, all of which are on the ballot next month, only the 3rd lacks a challenger. Only one or two other contests are considered competitive. That disenfranchises the majority of voters in Virginia, regardless of race. The legislature has its mandate to redraw the lines. We, the voters, have a mandate, too: to participate fully in the process and hold accountable those who would reduce us to nothing but a number. It’s not often that we get the opportunity for a do-over. Let’s make this one count. I’d love to see every district in Virginia be a competitive race.